WOW, what a day! I woke up tired and could not find my energy until my kids went and got me a DR. Pepper. Thank you kidlets. Disclaimer: I drink one Dr.Pepper a month. It's pretty much all that my family can handle me to drink. It really makes me run on super drive...I talk way too fast too. Yesterday I made gnocchi. I decided to bake my potatoes instead of boiling them for two reasons. One, I wanted the skins for tonights dinner and two, I did not want all of the water that my potatoes would absorb. That's another blog post for next week. I totally forgot about the skins and dinner came around and I was at a loss. It's not often I don't have a plan or have it already made from that morning. I opened the door and there staring at me were the skins. THANK YOU! BAM..it hit me. I had spinach, saw the eggs and cheese. I was going to use the skins as my crust and make mini quiches inside each of those golden potato skins. Seriously, my heart was fluttering with excitement..or it could have been the Dr. Pepper, no matter..I was on fire! And so it begins....my mouth starts watering, I can't wait for it to be done and the anticipation of whether or not the family will like it. Oh, they did! My son ate 6. This is a great appetizer, breakfast or dinner. You could use so many fun things in the skins other than spinach and onion. Get creative! OWN IT and make it yours. I used a cookie sheet to lay my skins on. I liked this idea because they could rest on each other while baking. Arrange your skins on the cookie sheet. Add chopped spinach and diced onion. Add cheese. Mix egg and cream, gently whisk to mix. Add the egg mixture to the potato skins. CAREFULLY fill the skins. 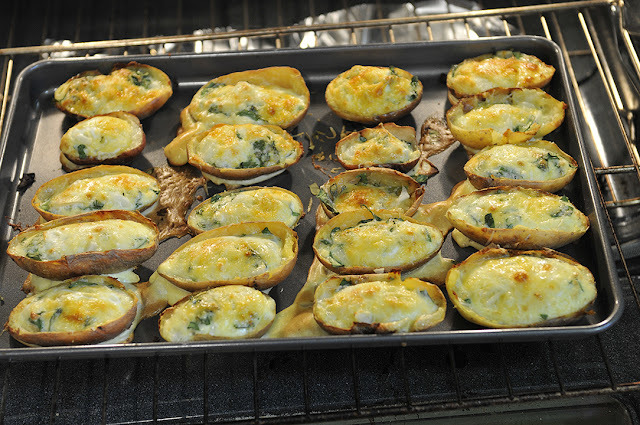 The egg is slippery and will slip right off of the spinach and cheese. I picked each skin up and slowly poured the egg inside. You will spill and some will tip and drip. The cookie sheet will get messy. It's ok because the skins will still cook just fine. Bake for 15-20 minutes. You will know they are done because they will have risen and should be firm to the touch. Serve skins with sour cream, salsa, guacamole or ranch dressing. NOTE: I used red and golden potatoes. They were not very large. I would say they averaged 4 inches long by 2 inches wide. 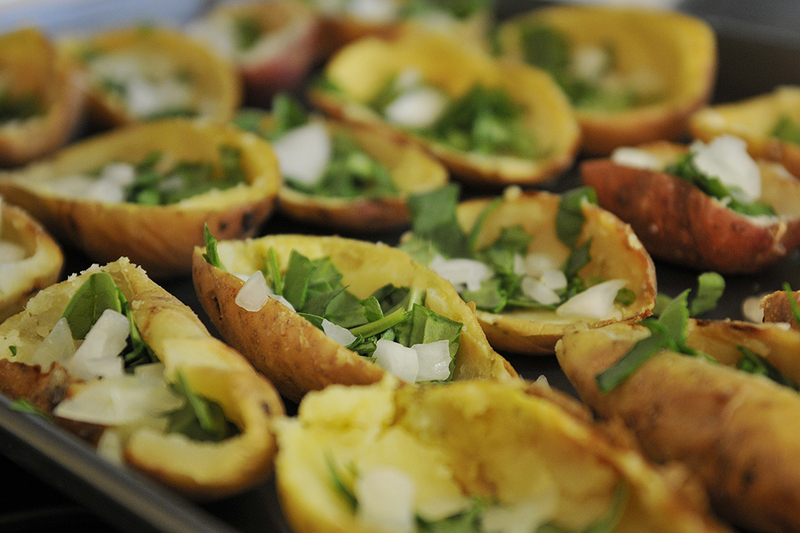 If you use larger potatoes, you will need to adjust the ingredient list to fill the skins. I figured it was one egg for every 4 skins. Let me know how it goes for you and your family. Also, I would love to know how you made these to fit your families taste. Next time I might add asparagus or sauteed mushrooms. YUM and ENJOY!